I've designed a cute and easy custom window treatment with curtain panels and a valence as my next project for Riley Blake's Design Team. Please head on over to their blog for the tutorial, which includes lots of step-by-step photos to help you, as well as a free, downloadable printer-friendly version too! For this project, I used three fabrics from the new line Apple of My Eye by The Quilted Fish for Riley Blake. It's perfect for a little girl's room! I used Pink Apple Basket for the main part of the curtain panels with a contrasting band along the bottom in Green Apple Herringbone, and Red Apple Dot for the valance. And I have to say, I love this Red Apple Dot. If you look closely, you can see that some of the dots are little apples to coordinate with all of the apples in the rest of the designs. This project is super easy, and really, you can customize it for any window in your house just by adjusting the lengths of the panels and keeping the hems and pockets the same measurements as in my version. In the tutorial I also share a little trick I use in projects, like this one, where I need to keep precise measurements while I'm pressing. It's so easy, but it saves a ton of time! 1. Leave a comment on this post telling me what you'd make if you win the Apple of My Eye precuts. 2. Followers of my blog will receive an additional entry. If you're a follower of my blog, please leave an additional comment telling me that you are. New followers are welcome! P.S. 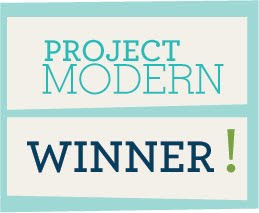 Please be sure that your email is either in the comment or connected to your blogger profile so I can let you know if you're the winner. Thank you! That's it! I'll use the random number generator to choose one winner and the giveaway will be open until Monday, May 14 at midnight ET. US entries only. Good luck! Great giveaway, thank you so much! I am willing to try a stripe quilt, so that is probably what I would do. Very cute window treatment! I'd make a quilt for DD with the precuts. All those precuts are just calling for a project from those wonderful Linton girls. Thanks for the giveaway. I am a follower of your blog. Thanks for the giveaway. I am a follower and want to just say how much I enjoy your blog! My 7 year old daughter's bed is red metal but she is wanting to re-do her room in pink. This project would be the PERFECT solution. Plus she could help me sew it...great mommy/daughter project. Thanks for the chance to win. This looks like great fabric for a baby quilt, thanks for the chance! Happy follower of your blog...adorable curtains, by the way! I think I would make a bunch of things, but to start I think the jelly roll would be perfect for a pretty summer table runner with maybe some cute ruffled embellished towels to match for a very lovely set for my kitchen! I think a baby quilt may be the way to go with that fabric, and one of my friends is expecting a baby this fall, so I have a baby quilt to make! Thanks for the chance. I am a follower of your blog via google reader. Thanks again! I would make a lap quilt with all the fun fabric!! Thanks for the chance to win! I would make a lap quilt. Love this fabric line. Been a follower via GFC for awhile now. I would love to make a coin quilt with the strips! I'd make a lap quilt! Thanks for the chance! :) The curtains are really cute! Not sure what I'd make!!! Those fabrics are perfect to make something for my girls (3 and 4.5). Thanks for the chance to win! Super cute! I would probably make a little bag for my daughter. I would make a baby quilt for one of my daughter's friends. Sweet fabric. I have some friends with babies coming later this summer and I might make a cute car seat cover, or a quilt. I'd make a Schnibble--probably Full House! WE just bought a new house and my daughter is finally get her own room!! I promised her I would make her a special room and this is SO fun and so cute!!! 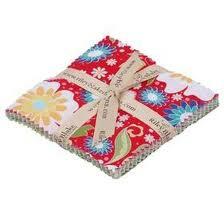 The reds would go into a red and white scrappy quilt I'm making - the rest would start a new quilt! I follow (and really enjoy) your blog! Very original! room is perfect for a child. Such pretty fabrics! I'd make a baby quilt, or a fun patchwork bag. What a wonderful giveaway! I would use little pieces over and over in many, many little quilt. Love the colors. I would design a little skirt or sundress for my 3 year old. I've always wanted to make an article of clothing by piecing small cuts together. 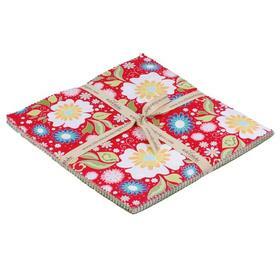 This looks like a great fabric for a fun picnic blanket - Jule 4th will be here soon! I would make a cheery little quilt. I would love some of this fabric. A quilt would be perfect for me. ALREADY FOLLOWING YOU VIA GFC + BLOG LOVIN'! LOVE this line, perfect for a quilt! I would make a baby quilt to be given away. Thanks for giveaway! I am an avid follower of your blog - I count myself lucky to have found you and all of your great projects and ideas. That fabric would be cute in a Big Girls bedroom, too! 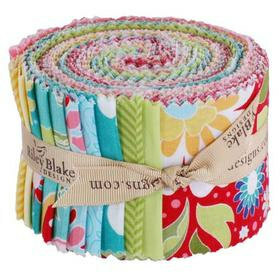 Love all of the Riley Blake fabrics! Great fabrics. I am leaning to either a lap robe or table topper. Thanks for the chance to win. They look like they would make the best kids' quilt. Thanks for the chance to win them. I would make a simple 4 patch quilt for my granddaughter. I am a beginner, so that would be easy for me. Or I could make a jelly roll quilt too. 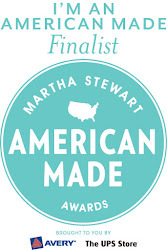 If I won, the fabric would go right into a child's quilt for our state guild charity- Cover Each Child. Fabulous fabrics! I would definitely make aprons -- lots of aprons! -- and potholders to match! I have been looking at this fabric for so long. I would use it to make some of the things for the Zakka sewalong. I'm a crazy quilter and would most use this new gifted fabric for a wild and crazy quilt for modern times! thanks for the chance to win! I'm a follower to my inbox, love your blog and this window treatment is a great tutorial. Well done, easy peasy! Apple of My Eye would make a great quilt for my great-niece. Thanks for the chance to win. I am a follower. I love to see all of the children's clothes that you make. I have tried some of them and give all of them away because I don't have small children. My friends all love the fact that I love to sew for everyone. I'd make a quilt for one of the many baby girls my friends seem to be having. Very cute! I think I'd hoarde them until someone I'm close with has a girl baby! I would make the apple of my eye (my niece) a lovely quilt! And I follow your blog in my google reader! Gorgeous fabrics.I`ll make a baby quilt .Thanks for the chance! Beautiful curtains.Of course,I`m a happy follower!!. Cute stuff! Some cute curtains for my daughter or maybe a fun springy table runner. Thanks!! I'm in need of a few reusable shopping bags. These would be nice for something patchy. Great giveaway. I'm not sure what I'd make at the moment but it sure would be cute. I follow you on reader, facebook and newsletter. I will use it for a bag or wallet. Beautiful and fresh. Cute! I love everything Riley Blake does! Things like this line look great in simple patchwork squares! cute and what a great idea. not sure what I would make if I won. Darling fabrics; great colors. I'm sure I can come up with some great ideas to use this fabric for. Thanks. Yes, I do follow you. Maybe a bright curtain for my craft room. Just love this fabric. I'd make a sweet little cuddle quilt for my seven year old! I'm a subscriber, thank you! I would probably make a quilt for my daughter with some pillow cases. THen I would have to get some matching fabric and do those curtains you made!! Thanks so much for the chance to win. Riley Blake is my favorite! I am following your blog :) Thanks again for the chance to win! I'm a follower of your blog. Thank you for the chance ! I would made some cushions ... I like the colors ! I would make a throw quilt & some cushion (pillow) covers with these gorgeous fabrics. I love your curtains. Thanks for the giveaway. I'm a happy follower of your blog, thanks. We just put some bunkbeds up for when the grandkids come to visit...I'd like to make strippy coverlets to match..that line is so cheery and kid friendly! I have a nine year old niece who would love a bag made from these prints! And the leftovers would make a great scrappy quilt. I would make a baby quilt, cushions and furnishings for my soon to be born Grand daughter. It is beautiful fabric. I would love to win! I have quilt top planned that Apple of My Eye would be PERFECT for! And I am a follower, thanks for the second chance! How did you know that I have a new house with too many bare windows that need curtains. I love this idea. My studio windows would look awesome with a pair made with Apple of My eye. I would make a colorful baby quilt. And yes, I am a follower. Thanks for sharing your creative world. I would probably make a tote/bag/wallet and maybe a blanket or something along those lines with these wonderful precuts!!! Thanks for the chance to win! I have no idea what to make with it yet, but most likely it will be in a quilt of some form. Thanks for the chance. I'd make a quilt for my daughter if I won. Would love to use the fabric for coordinated book carriers for my granddaughters and me...won't we look cute at the library? D.
Maybe some patchwork skirts for my girls!